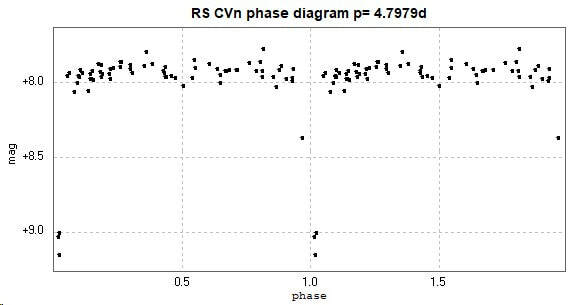 Light curve and phase diagram of the EA type eclipsing binary RS Canum Venaticorum / RS CVn. These were constructed from photometry of 71 images taken through a green filter with the Bradford Robotic Telescope Cluster Camera between 2015 January 17 and 2016 January 17. The catalogue period for this star is 4.7976966d (GCVS), 4.797887d (AAVSO VSX) and 4.797705d (Kreiner). There is considerable o-c activity with this star (Kreiner). 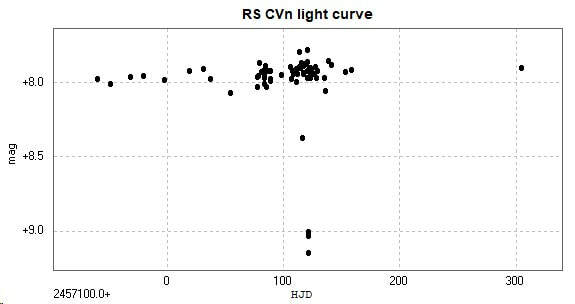 This star is the prototype of the RS CVn type variable, where one or both components display eruptive type variability in addition to that due to the eclipses. (Accessed 2018 November 7).